Dachau concentration camp (German: Konzentrationslager (KZ) Dachau, IPA:[?daxa?]) was the first Nazi concentration camp opened in Germany, located on the grounds of an abandoned munitions factory near the medieval town of Dachau, about 16 km (9.9 mi) northwest of Munich in the state of Bavaria, which is located in southern Germany. Opened 22 March 1933 (51 days after Hitler took power), it was the first regular concentration camp established by the coalition government of the National Socialist Party (Nazi Party) and the German Nationalist People's Party (dissolved on 6 July 1933). Heinrich Himmler, then Chief of Police of Munich, officially described the camp as "the first concentration camp for political prisoners." Dachau served as a prototype and model for the other Nazi concentration camps that followed. Almost every community in Germany had members taken away to these camps. Newspapers continually reported of "the removal of the enemies of the Reich to concentration camps", and as early as 1935 there were jingles warning: "Dear God, make me dumb, that I may not to Dachau come" ("Lieber Gott, mach mich dumm, damit ich nicht nach Dachau kumm"). The camp's basic organization: layout as well as building plans, were developed by Kommandant Theodor Eicke and were applied to all later camps. He had a separate secure camp near the command center, which consisted of living quarters, administration, and army camps. Eicke himself became the chief inspector for all concentration camps, responsible for molding the others according to his model. The entrance gate to this concentration camp carries the words "Arbeit macht frei", meaning "work will liberate". The camp was in use from 1933 to 1960, the first twelve years as an internment center of the Third Reich. From 1933 to 1938 the prisoners were mainly German nationals detained for political reasons. Subsequently the camp was used for prisoners of all sorts from every nation occupied by the forces of the Third Reich. From 1945 through 1948 the camp was used as a prison for SS officers awaiting trial. 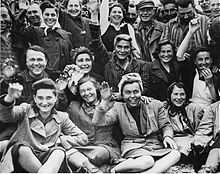 After 1948 the German population expelled from Czechoslovakia were housed there and it was also a base of the United States. It was closed in 1960 and thereafter, at the insistence of ex-prisoners, various memorials began to be constructed there. Estimates of the demographic statistics vary but they are in the same general range. History may never know how many people were interned there or died there, due to periods of disruption. One source gives a general estimate of over 200,000 prisoners from more than 30 countries for the Third Reich's years, of whom two-thirds were political prisoners and nearly one-third were Jews. 25,613 prisoners are believed to have died in the camp and almost another 10,000 in its subcamps, primarily from disease, malnutrition and suicide. In early 1945, there was a typhus epidemic in the camp due to influx from other camps causing overcrowding, followed by an evacuation, in which large numbers of the weaker prisoners died. Toward the end of the war death marches to and from the camp caused the expiration of large but unknown numbers of prisoners. Even after liberation, prisoners weakened beyond recovery continued to die. Over its twelve years as a concentration camp, the Dachau administration recorded the intake of 206,206 prisoners and 31,951 deaths. Crematoria were constructed to dispose of the deceased. These numbers do not tell the entire story, however. Although there is no evidence of mass murder within the camp — by methods other than poor sanitation, deprivation of medical care, withholding of nutrients, medical experiments, or beatings and shootings for infractions of the rules or at random — beginning in 1942 more than 3166 prisoners in weakened condition were transported to Hartheim Castle near Linz and there were executed by poison gas for reason of their unfitness. In 1941 and 1942 an unknown number of prisoners of war from the Soviet Union were executed by shooting at the camp's surrounding firing ranges, some for target practice and for sport. Together with the much larger Auschwitz, Dachau has come to symbolize the Nazi concentration camps to many people. Konzentrationslager (KZ) Dachau holds a significant place in public memory because it was the second camp to be liberated by British or American forces. Therefore, it was one of the first places where these previously unknown Nazi practices were exposed to the Western world through firsthand journalist accounts and through newsreels. The Dachau camp was created for holding political opponents. Around Christmas 1933, roughly 6,000 of the inmates were released as part of a pardoning action. The picture depicts a speech by the camp commander to prisoners about to be released. Once the Nazis came to power they quickly moved to ruthlessly suppress all real or potential opposition. For example, between 1933 and 1945, the Sondergerichte which were "special courts" set up by the Nazi regime killed 12,000 Germans. Especially during the first years of their existence these courts "had a strong deterrent effect" against opposition to the Nazis, the German public was intimidated through "arbitrary psychological terror". Use of the word concentration comes from the idea of concentrating a group of people who are in some way undesirable in one place, where they can be watched by those who incarcerated them. Concentration camps had in the past been used by the U.S. against native Americans, the British in the Boer Wars, and others. The term originated in the "reconcentration camps" set up in Cuba by General Valeriano Weyler in 1897. Inspection by the Nazi party and Himmlerat Dachau on 8 May 1936. Dachau was the first regular concentration camp established by the coalition government of National Socialist Party (Nazi Party) and the German Nationalist People's Party (dissolved on 6 July 1933). Heinrich Himmler, Chief of Police of Munich, officially described the camp as "the first concentration camp for political prisoners." Between the years 1933 and 1945 more than 3.5 million Germans would be forced to spend time in these concentration camps or prison for political reasons, and approximately 77,000 Germans were killed for one or another form of resistance by Special Courts, courts martial, and the civil justice system. Many of these Germans had served in government, the military, or in civil positions, which enabled them to engage in subversion and conspiracy against the Nazis. 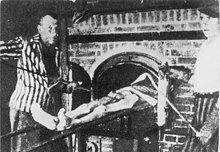 Following the Holocaust, the term "concentration camp" carries many of the connotations of "extermination camp" and is sometimes used synonymously. Because of these negative connotations, the term "concentration camp", originally itself a euphemism, has been replaced by newer euphemisms such as internment camp, resettlement camp, detention facility, etc., regardless of the actual circumstances of the camp, which can vary a great deal. The camp was divided into two sections: the camp area and the crematorium. The camp area consisted of 69 barracks, including one for clergy imprisoned for opposing the Nazi regime and one reserved for medical experiments. The courtyard between the prison and the central kitchen was used for the summary execution of prisoners. The camp was surrounded by an electrified barbed-wire gate, a ditch, and a wall with seven guard towers. In early 1937, the SS, using prisoner labor, initiated construction of a large complex of buildings on the grounds of the original camp. The construction was officially completed in mid-August 1938 and the camp remained essentially unchanged and in operation until 1945. Dachau thus was the longest running concentration camp of the Third Reich. The area in Dachau included other SS facilities beside the concentration camp—a leader school[ of the economic and civil service, the medical school of the SS, etc. The KZ at that time was called a "protective custody camp," and occupied less than half of the area of the entire complex. Polish prisoners in Dachau toast their liberation from the camp. Poles constituted the largest ethnic group in the camp during the war, followed by Russians, French, Yugoslavs, Jews, and Czechs. The camp was originally designed for holding German political prisoners and Jews, but in 1935 it also began to hold ordinary criminals. During the war it came to also include other nationalities such as French, in 1940 Poles, 1941 people from the Balkans, and in 1942 Russians. Before the war the biggest groups of inmates were Germans, Austrians, and Jews. During the War the biggest groups were, in order of size; Poles, Russians, French, Yugoslavs, Jews, and Czechs. Inside the camp there was a sharp division between the two groups of prisoners; those who were there for political reasons and therefore wore a red tag, and the criminals, who wore a green tag. The average number of Germans in the camp during the war was 3000. Just before the liberation many German prisoners were evacuated, but 2000 of these Germans died during the evacuation transport. 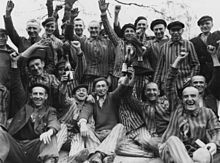 Evacuated prisoners included famous political and religious hostages held in Dachau,such as Martin Niemöller, Kurt von Schuschnigg, Édouard Daladier, Léon Blum, Franz Halder and Hjalmar Schacht. At the time of liberation the death rate had peaked at 200 per day, after the liberation by U.S. forces this was eventually reduced to between 50 and 80 deaths per day. The cause of these deaths was, besides the murderous SS policies, typhus epidemics and starvation which claimed thousands of lives. The number of inmates had peaked in 1944 with transports from evacuated camps in the east (such as Auschwitz) and the resulting overcrowding led to an increase in the death rate. Dachau also served as the central camp for Christian religious prisoners. At least 3,000 Catholic priests, deacons, and bishops were imprisoned there. In August 1944 a women's camp opened inside Dachau. In the last months of the war, the conditions at Dachau became even worse. As Allied forces advanced toward Germany, the Germans began to move prisoners in concentration camps near the front to more centrally located camps. They hoped to prevent the liberation of large numbers of prisoners. Transports from the evacuated camps arrived continuously at Dachau. After days of travel with little or no food or water, the prisoners arrived weak and exhausted, often near death. Typhus epidemics became a serious problem as a result of overcrowding, poor sanitary conditions, insufficient provisions, and the weakened state of the prisoners. Owing to continual new transportations from the front, the camp was constantly overcrowded and the hygiene conditions were beneath human dignity. Starting from the end of 1944 up to the day of liberation, 15,000 people died, about half of all victims in KZ Dachau. Five hundred Soviet POWs were executed by firing squad. Its first shipment of women came from Auschwitz Birkenau. Only 19 women guards served at Dachau, most of them until liberation. Sources show the names of sixteen of the nineteen women guarding the camp; Fanny Baur, Leopoldine Bittermann, Ernestine Brenner, Anna Buck, Rosa Dolaschko, Maria Eder, Rosa Grassmann, Betty Hanneschaleger, Ruth Elfriede Hildner, Josefa Keller, Berta Kimplinger, Lieselotte Klaudat, Theresia Kopp, Rosalie Leimboeck, and Thea Miesl. Women guards were also staffed at the Augsburg Michelwerke, Burgau, Kaufering, Mühldorf, and Munich Agfa Camera Werke subcamps. In mid-April 1945 many female subcamps at Kaufering, Augsburg and Munich closed, and the SS women stationed at Dachau. It is reported that female SS guards gave prisoners guns before liberation to save them from postwar prosecution. Liberated female prisoners at Dachau wave to their liberators. On 24 April 1945, about 140 prominent inmates, such as Léon Blum, Martin Niemöller, Dan Hartzman, and Franz Halder, weretransferred to Tyrol, where the SS left the prisoners behind. They were later liberated by the Fifth U.S. Army on 5 May 1945 inNiederdorf, South Tyrol. On 27 April 1945, Victor Maurer, delegate of the International Committee of the Red Cross, was allowed to enter camps and distribute food. In the evening of the same day a prisoner transport arrived from Buchenwald. Only 800 survivors were brought from the original 4,480 to 4,800 prisoners in transit. Over 2,300 corpses were left lying in and around the train. The last regular commander of the KZ, Obersturmbannführer Eduard Weiter, had fled on 26 April. He probably followed Obersturmbannführer Martin Gottfried Weiss, who had led the camp from September 1942 until November 1943. On 28 April 1945, the day before the surrender, Camp Commandant Martin Gottfried Weiss had left the Dachau camp, along with most of the regular guards and administrators in the camp. On that same day, Victor Maurer, a representative of the Red Cross, had tried to persuade Untersturmführer Johannes Otto, the adjutant of Commandant Weiss, not to abandon the camp, but to leave guards posted to keep the prisoners inside until the Americans arrived. Maurer feared that the prisoners would escape_en masse_ and spread the active typhus fever epidemic. Lt. Otto declined to remain and fled. On 29 April 1945, the watchtowers of the Dachau camp remained occupied and a white flag was hoisted. Red Cross representative Maurer persuaded SS-Untersturmführer Heinrich Wicker, an NCO in the SS-Totenkopfverbände, to accompany him to the main gate of the complex to surrender the camp formally. American soldiers of the U.S. 7th Army force boys, believed to be Hitler youth, to examine boxcars containing bodies of prisoners starved to death by the SS. "As we moved down along the west side of the concentration camp and approached the southwest corner, three people approached down the road under a flag of truce. We met these people about 75 yards north of the southwest entrance to the camp. These three people were a Swiss Red Cross representative and two SS troopers who said they were the camp commander and assistant camp commander and that they had come into the camp on the night of the 28th to take over from the regular camp personnel for the purpose of turning the camp over to the advancing Americans. The Swiss Red Cross representative acted as interpreter and stated that there were about 100 SS guards in the camp who had their arms stacked except for the people in the tower. He said he had given instructions that there would be no shots fired and it would take about 50 men to relieve the guards, as there were 42,000 half-crazed prisoners of war in the camp, many of them typhus infected. He asked if I were an officer of the American army, to which I replied, "Yes, I am Assistant Division Commander of the 42nd Division and will accept the surrender of the camp in the name of the Rainbow Division for the American army." 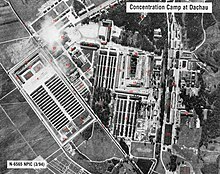 General Dwight D. Eisenhower, issued a communique over the capture of Dachau concentration camp: "Our forces liberated and mopped up the infamous concentration camp at Dachau. Approximately 32,000 prisoners were liberated; 300 SS camp guards were quickly neutralized." A tablet at the camp commemorates the liberation of Dachau by the 42nd Infantry Division of the U.S. Seventh Army on 29 April 1945. Others claim that the first forces to enter the main camp were a battalion of the 157th Infantry Regiment of the 45th Infantry Division commanded by Felix L. Sparks. Both the 42nd and 45th Infantry Divisions are recognized by the U.S. Army as liberators of Dachau. General Patton visited the Buchenwald camp after it was liberated, but not Dachau. The Americans found approximately 32,000 prisoners, crammed 1,600 to each of 20 barracks, which had been designed to house 250 people each. During the liberation of the sub-camps surrounding Dachau (which happened on the same day as the main camp's surrender on 29 April) the advance scouts of the US Army's 522nd Field Artillery Battalion, a Nisei-manned segregated Japanese-American Allied military unit, liberated the 3,000 prisoners of the "Kaufering IV Hurlach" slave labor camp. Perisco describes an Office of Strategic Services (OSS) team (code name LUXE) leading Army Intelligence to a "Camp IV" on 29 April. "they found the camp afire and a stack of some four hundred bodies burning... American soldiers then went into Landsberg and rounded up all the male civilians they could find and marched them out to the camp. The former commandant was forced to lie amidst a pile of corpses. The male population of Landsberg was then ordered to walk by, and ordered to spit on the commandant as they passed. The commandant was then turned over to a group of liberated camp survivors."